Next PostNext New #ShareYourEars Walls Have Arrived at Walt Disney World! Is the Force with You? Themes for 2019 Star Wars Rival Run Weekend Announced! Earlier this year, Walt Disney World announced that the fourth year of its Star Wars race weekend, to be held April 4 – 7, 2019, would celebrate the rivalries of the Star Wars saga. To add to the fun of these actual races, you can also take part in The Kessel Run Challenge, which requires runners to complete the Star Wars Rival Run Half Marathon at Walt Disney World AND the Star Wars Virtual Half Marathon at home. You must register for the runDisney Kessel Run Challenge plus the Star Wars Rival Run Half Marathon or Star Wars Rival Run Challenge in order to participate. Kessel Run Challenge participants will receive their Star Wars Virtual Half Marathon medals and Star Wars-themed keepsakes at the runDisney Health & Fitness Expo during the Star Wars Rival Run Weekend. Upon completion of the Star Wars Rival Run Half Marathon (within the pacing requirements), participants will be awarded the Kessel Run Challenge medal. This year’s Virtual Half Marathon theme is that perennial droid favorite, R2-D2! If you register for the 5K, 10K, Half Marathon and Challenge by January 15, 2019, you’ll have the chance to choose whether you’re running for the Dark or the Light Side, and the design of your race bib will show that! Register after that date and The Force will choose your fate! There are still spots for both the 2019 Star Wars Rival Run Weekend events as well as the 2019 Star Wars Virtual Half Marathon. To learn more about this and other runDisney events, visit runDisney online. Thinking about joining the Dark Side for this race weekend? Check out our report on last year’s event. Already planning to run? 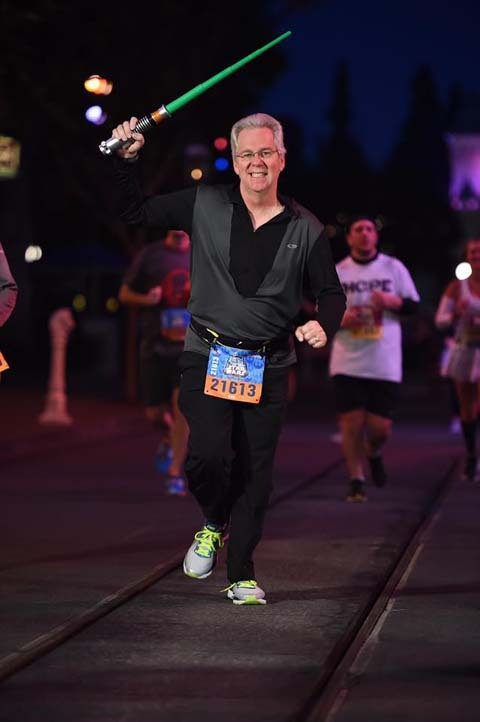 Read our tips for running in the Star Wars Half Marathon! And let us know if you’re running in the comments below!